Okay, I’ve been having fun with this whole bread making thing – you were right Dr. N.
Cinnamon, nutmeg, raisins and nuts made with whole grain starter dough. Yummy and healthy! But in keeping with me – I’ve already been playing around with the recipe. I took the Master Recipe from Artisan Bread in 5 Minutes a Day and changed it to a whole wheat version, and this morning I adapted the sticky bun recipe to make a cinnamon, raisin (because everything is better with raisins) and pecan loaf. Here’s what I did. I then placed it on a well-floured board (I put some whole wheat flour in my coffee grinder to make it softer) then rolled out the dough (flour the top) to 1/8″ thick. 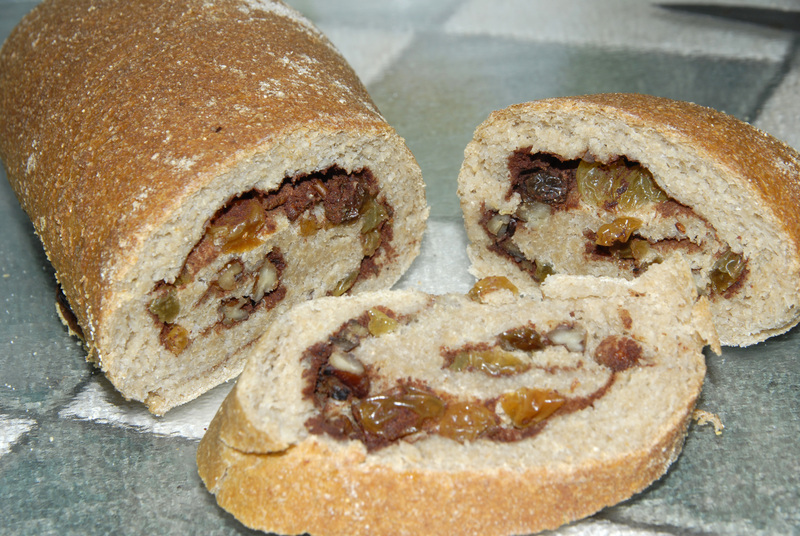 Starting on short side, I rolled up the loaf, replacing any lost nuts or raisins – didn’t want to lose even one! 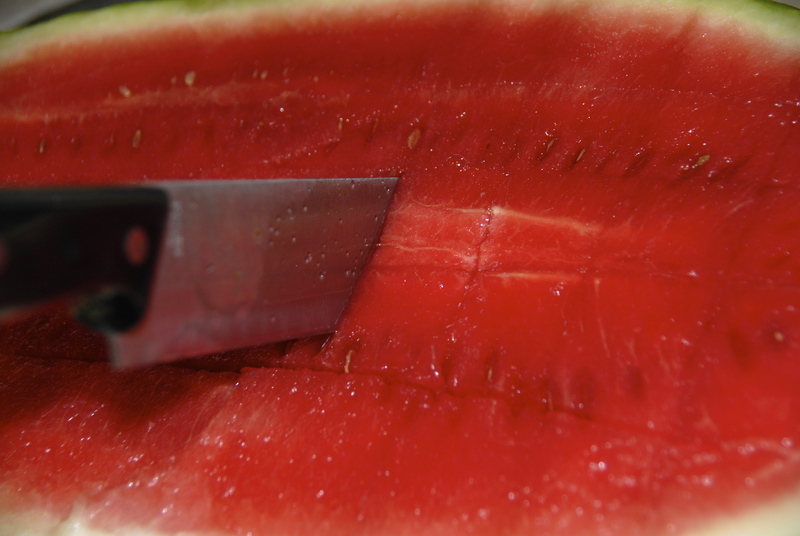 Finally, pinch the ends shut and slash the top. 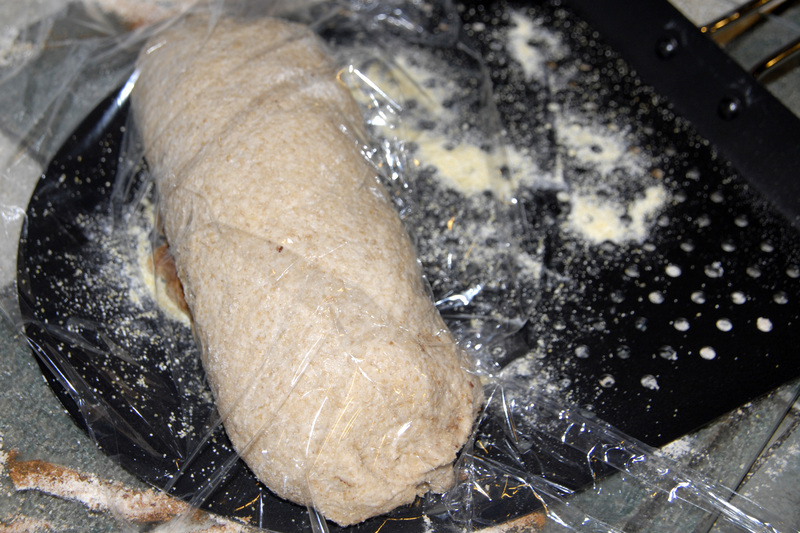 Here is what the rolled up loaf looks like; sorry, I forgot to take a photo of the pre-rolled, cinnamon, raisin and nut covered dough. Oh, by the way, I got my pizza peel on sale at the outlet mall in OKC on sale for $6.40 – They had extra large wooden peels for under $10 as well. I didn’t need one that big, so I opted for the BBQ variety, which is smaller and lighter. The only problem is that the holes make it hard to get any cornmeal on it. I guess I could sprinkle some on the stone right before I put the loaf in the oven or try it without the cornmeal at all. Move loaf to a pizza peel that has been sprinkled with cornmeal. Cover loosely with plastic wrap and let set or rise for 60 minutes. The book said you can also use parchment paper; I haven’t done this yet, because the stuff is expensive and not exactly eco-friendly. But seeing how the cornmeal is ruining my stone and smells horrible when it burns, I may give it a try next time. Add yeast and salt to warm water in 5 quart bowl with a resealable lidd (not airtight). Don’t worry about getting it all to dissolve. 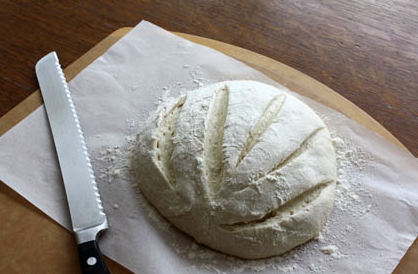 Mix in all flour at once – kneading is not necessary. Be sure to measure with dry measure cup; gently scoop up flour, then sweep the top level with the back of a butter knife. Do not tamp or shake down so as not to throw off recipe. Mix with wooden spoon until the mixture is uniform. If the mixing becomes too difficult, mix with wet hands and press the mixture together. Don’t knead! Cover with a lid (not airtight). Allow mixture to rise at room temp until it begins to collapse or flatten on top. You may not notice this using whole wheat flour, but approximately 2 hours, depending on room temp. Longer rising time up to 5 hours will not harm the results. You can use a portion of the dough any time after this period, but fully refrigerated wet dough is easier to handle and less sticky. It is best if stored in the refrigerator over night or at least 3 hours. Sprinkle the surface of refrigerated dough lightly with flour (I used WW flour that I re-ground in my coffee grinder). Pull off a 1 lb. piece of dough (size of a grapefruit). 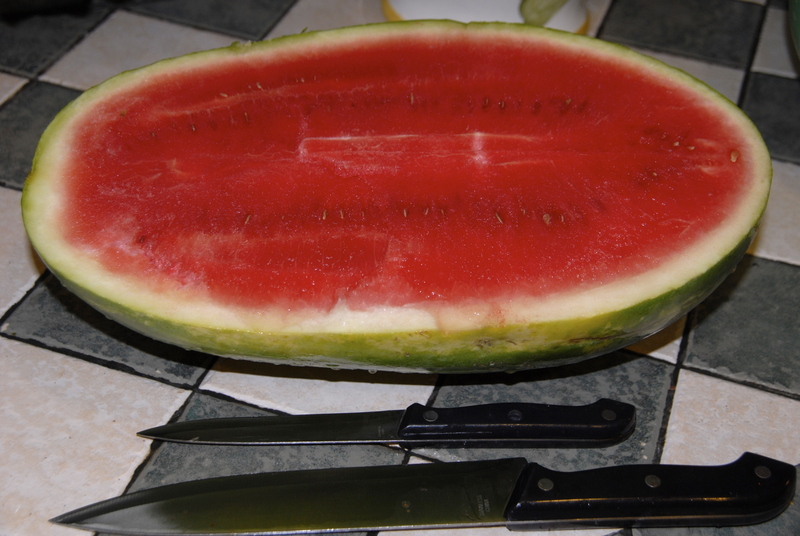 If needed, you can cut it free with a serrated knife. Hold dough in hand and add a little more flour as needed so it won’t stick to hands. (Sorry, with WW dough, it will stick). Pull or stretch four corners and tuck under to form a ball. The final product should be smooth and cohesive. (WW is not that smooth.) Transfer loaf to a pizza peel sprinkled with cornmeal. Dust and slash. Dust the top liberally with flour and slash a 1/4 inch deep cross, scallop or tic-tac-toe pattern into the top using a serrated knife. Let rest for 40 minutes. 20 minutes before baking, preheat oven at 450 (I burnt my first loaf so lowered to 425), with a pizza stone and empty broiler pan under the rack with the stone. When timer goes off, transfer loaf from pizza peel to stone and immediately pour 1 cup of hot water in broiler pan. Shut door and cook for 30 minutes or until the bread is golden brown. The cornmeal will burn, so try not to open door too soon or steam will escape. 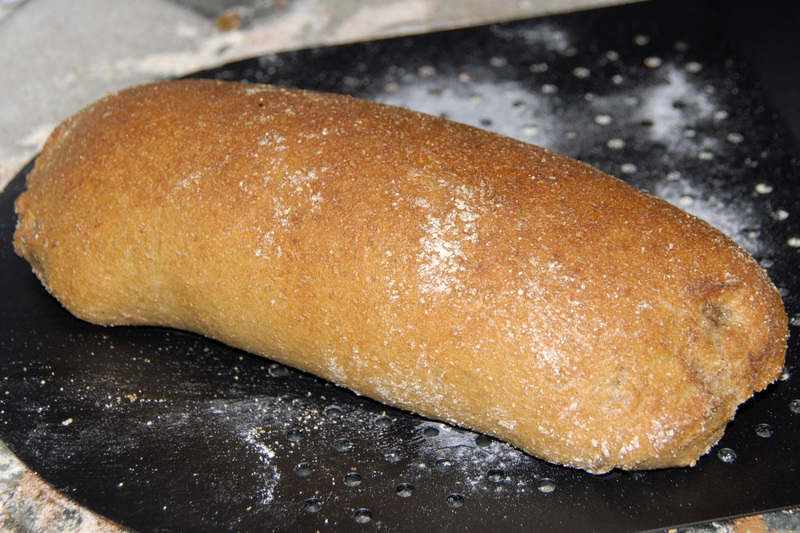 When you remove bread from oven it will audibly crackle, or “sing”. (mine didn’t do this as I cooked it too long. It says to let cool completely on wire rack, but I was in a hurry the first time and cut it about 5 minutes out of the oven and it was good. The remaining dough can be stored in refrigerator for up to 14 days. The older it gets, the more of a sour dough quality it will gain. When depleted, don’t wash the container and remix the next batch. 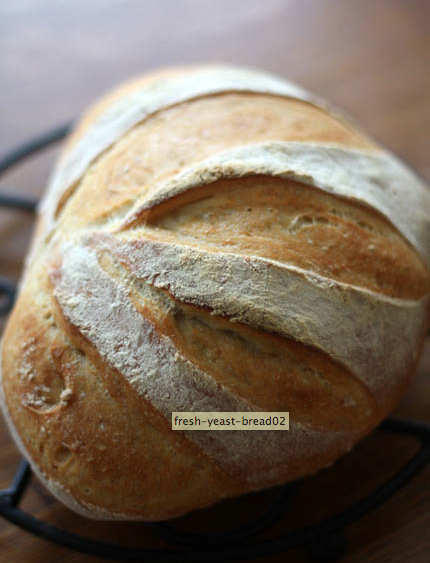 The container will retain the “sour dough” quality as a starter for the next batch. 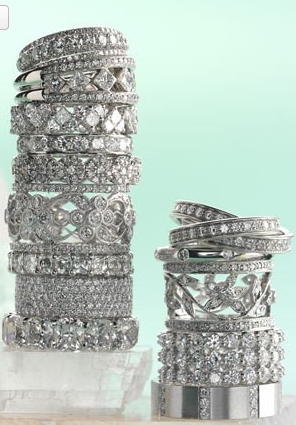 For Me, I just like Sparkly things. Yes, I love being married too and will have been for 34 years this coming March, but I have to say, I just love the way gems sparkle and make me feel pretty. But again I digress. This post is about our OTHER best friend. The one that soothes our savage breasts or at least calms us during that ugly time of the month when we become less than beautiful princesses or love goddess. I have had a long love affair with chocolate. I’ve often teased that whereas some members of my family became addicted to things that eventually killed their bodies, I, being one with my genetic heritage, became addicted to chocolate. I mean I love it in almost any form. Chocolate chip cookies, double chocolate cake, chocolate candy (especially if you throw in some carmel and pecans), chocolate fudge – heck, I even love just plain chocolate chips. 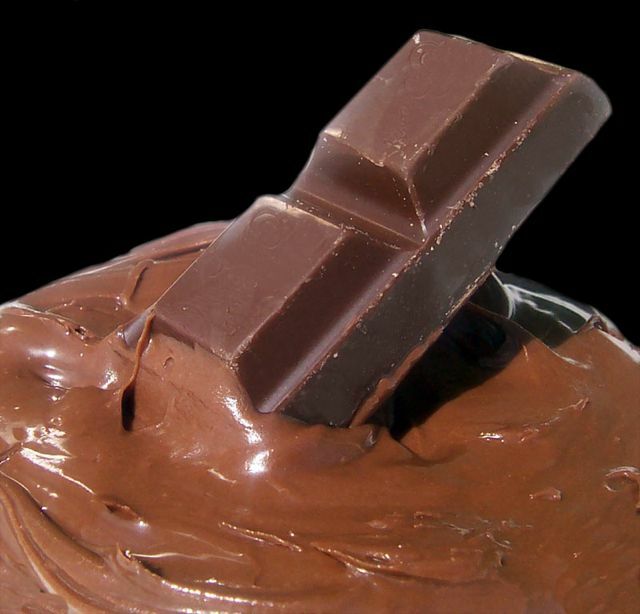 Since I have become cold natured after losing over 155 pounds (hard to do when you are addicted to chocolate), I have found a new favorite chocolate indulgence that not only keeps me from ruining my new healthier lifestyle, but also quiets the cravings for chocolate – oh, and with an added benefit of warming me up! 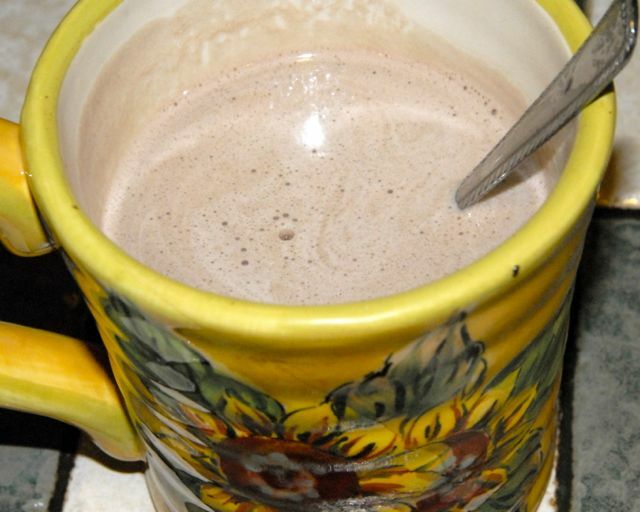 I’m talking about Homemade Hot Chocolate! There is nothing better to warm your bones and your heart than a creamy cup of hot chocolate. Up for a little adventure? Try adding a dash of cinnamon or chili powder. Now, I must confess, I didn’t make this one up on my own. A good friend, Deborah Buchanan, shared her recipe with me, and I’ve been making it almost every day since. There is no sugar in this recipe, just a bit of Splenda, and if you use skim milk, there is also no fat. I’ve even made it with almond milk – Blue Diamond, Almond Breeze is the best, for those with lactose intolerance; it just takes a bit more patience to make. What you get is a yummy, wholesome, rich, easy-to-make, chocolaty treat. Enough chocolate to help you through the most severe chocolate withdrawals and I’m sure it is totally approved by CA (Chocoholic’s Anonymous). I know it works for me; sometimes I even splurge and toss in a dollop of whipped cream if I’m feeling naughty. So get out your mug, spoon in some good quality cocoa and prepared to be hooked – you won’t regret it. In a microwave safe container, heat one cup of skim milk for one and a half minutes or until piping hot! If you are using almond milk, this step will take longer as you must heat it of half power, it usually takes about 3 to 3 1/2 minutes. 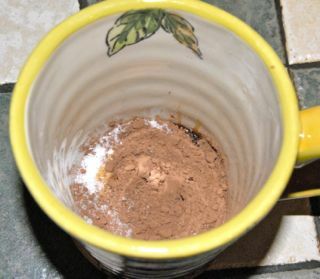 While the milk is heating, put the next three ingredients into your mug. You can squish out the cocoa lumps if you like while you are waiting. When the milk is heated, pour about 2 tablespoons of hot milk on dry mixture and mix well getting out all lumps. This will form a thick chocolaty paste. 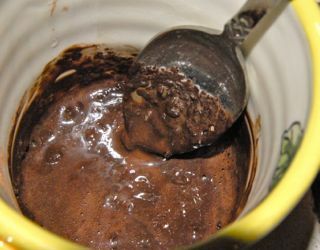 When you have your lumps out, continue pouring the hot milk over the chocolate mixture. Stir until well blended. Top with whipped cream or mini marshmallows. Enjoy! The first of a new year always brings about an onslaught of promises to eat better and get more exercise. Along about March, many of us have problems sticking with those promises, especially when it comes to denying our sweet tooth. And frankly, artificially sweetened food with aspartame, only makes us grave real sugar and more carbs. When my husband and I started our journey to a healthier lifestyle, we too faced the same dilemma with wanting something sweet to satisfy our hunger for sugar. One night as I was fixing our dinner of lean protein and vegetables, I glanced over at our fruit bowl and noticed that the pears and apples were getting a little past their prime. An idea formed, and I got out the cutting board, a casserole dish and some other good ingredients and began to prepare what has become one of our most favorite and satisfying desserts. 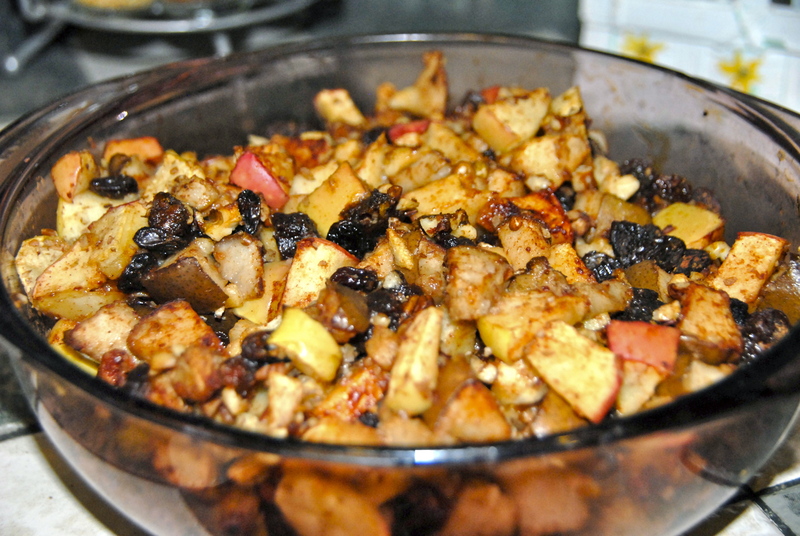 I chopped the pairs and apples in small bite-size portions and added them to the casserole dish alternately with golden raisins (its what I had, but I like it better with this type), chopped pecans, cinnamon and a small amount of Splenda. I’ve never really measured any ingredients, I just mix it until it looks good! 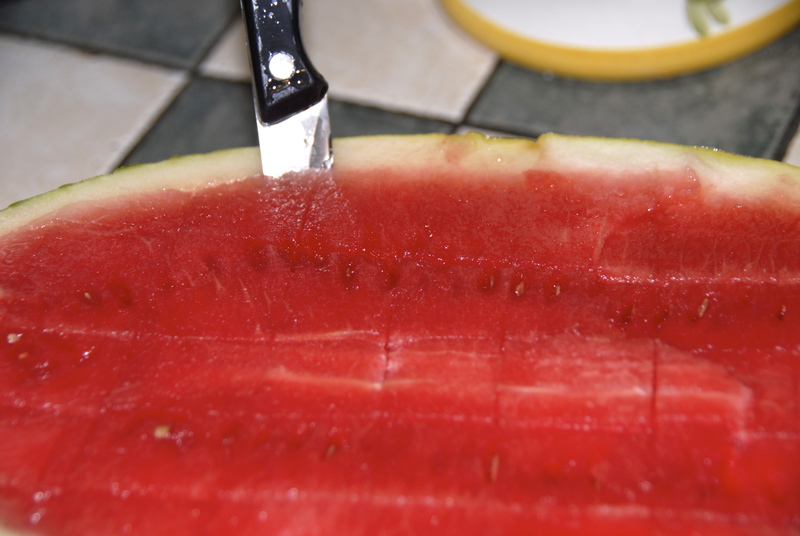 Make sure your fruit compote is mixed well, if you think it needs it, you can add a little water. I stirred it all really well and popped it into a 350 degree oven for about 45-60 minutes. The result was so yummy – kind of like an apple pie with no crust or sugar. 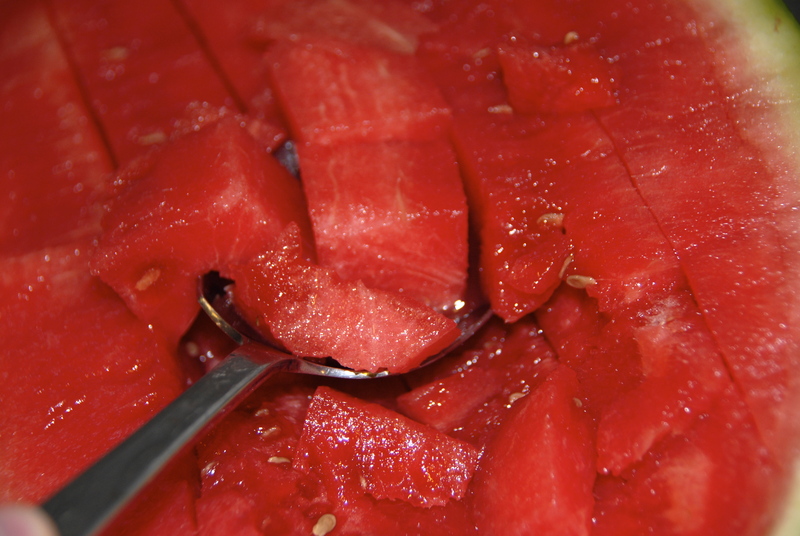 And although the fruit does have carbs you need to count (if you are diabetic), it is totally free of processed sugar. Yes, it is true that Splenda is an artificial sweetener, but it is more natural and less harmful than the others. 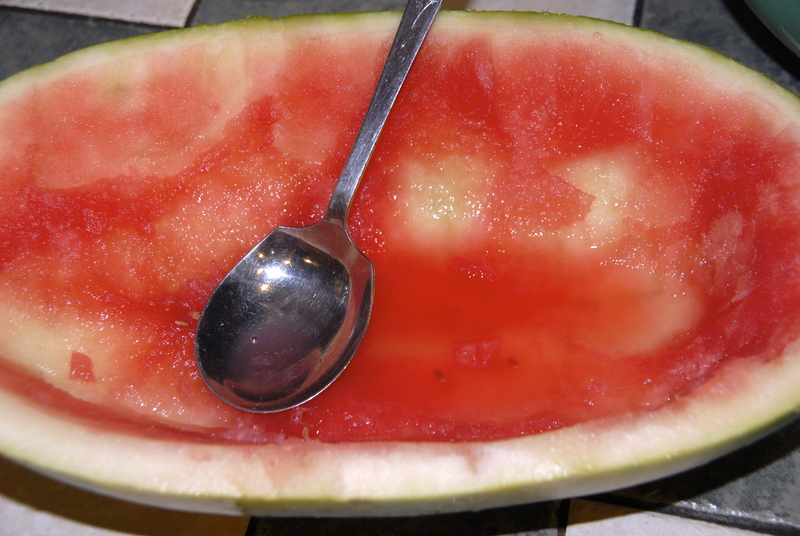 A person could omit this step or use honey (be careful, honey has a lot of sugar grams), but using less than a 1/4 of a cup for the large bowl of fruit is worth it. 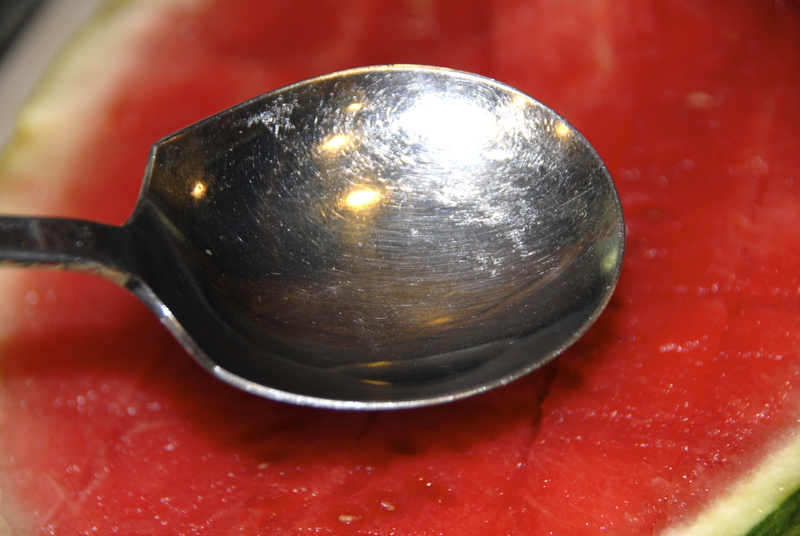 When the fruit compote is done, it will be golden brown and the fruit will be soft. Don't overcook or your raisins will burn. If needed, you can cover for the last 15 minutes of cooking. You can even vary the ingredients if you want, but I’m not sure what other fresh fruit would work well – maybe peaches. Hmm, I’ll have to try that one. I did add dates one time – won’t do that again! I do love dates in cookies, but in this compote, they became mushy and grainy. I didn’t like them in it at all. I’ve also used other nuts like walnuts and almonds – you could use multiple kinds of nuts. But to date, my favorite way of having this delectable treat is with my original recipe. 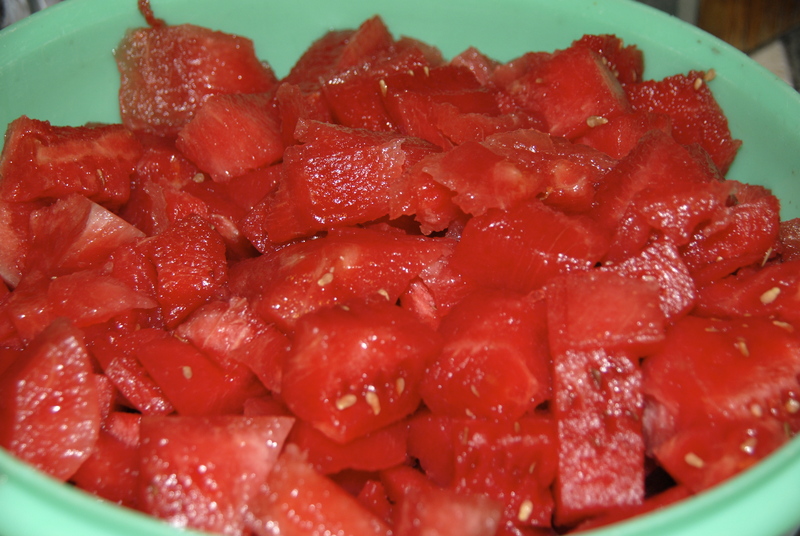 I make it whenever I have fruit about to go south, and it lasts us about a week or more. Be sure to warm up leftovers a bit, because this is one dish best served heated. Mix ingredients alternately and stir until all fruit is well coated with cinnamon. 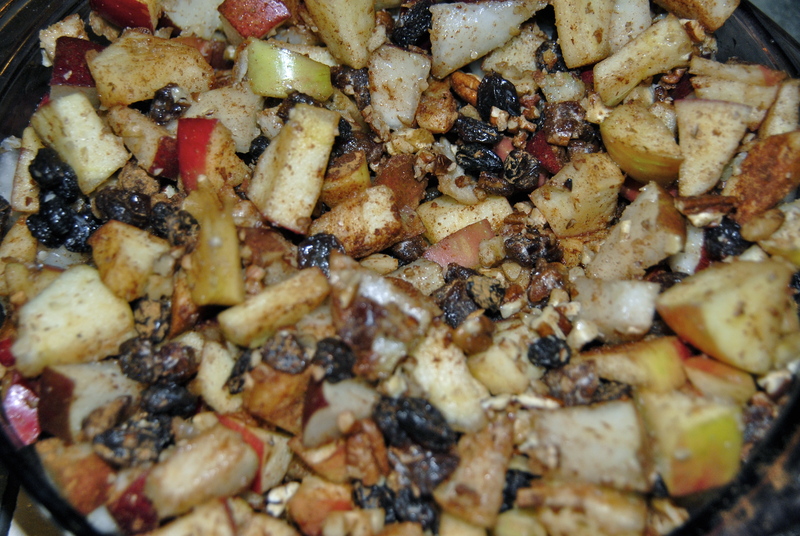 Bake in a 350 oven for 45-60 minutes until tender; stirring every 15 to 20 minutes to prevent top raisins from burning. Allow to cool a bit before serving. After converting to a healthier lifestyle over a year and a half ago, finding new and interesting recipes that are healthy, yet tasty, has become a challenge. Mostly, I’ve just gotten lazy and bored. 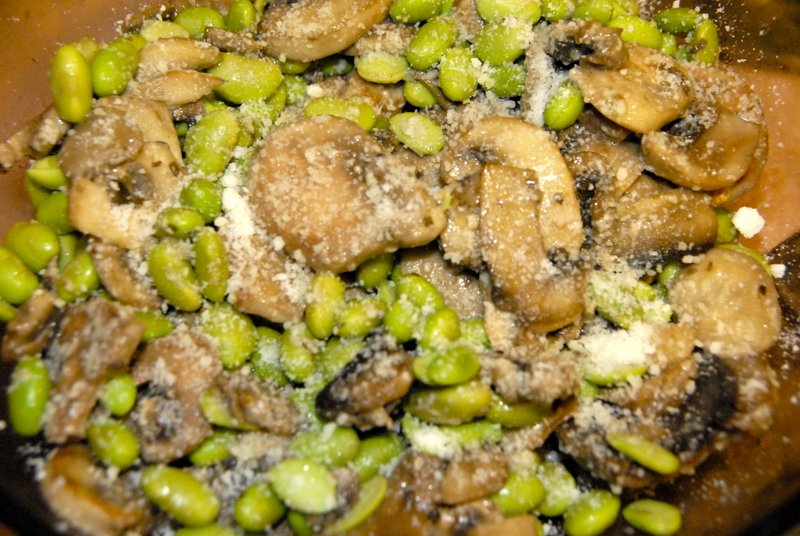 Chicken is by far the best protein source, with the exception of Edamame – that’s soy beans to the lay person. But I’m really fussy about my chicken; I will only eat boneless, skinless chicken breast meat – probably helped butcher one too many chickens in my youth. And before you mention fish, just know I don’t eat anything that comes out of water. The lazy and boring part comes into play about now. I’ve grilled or baked chicken breasts a number of different ways, but after a while, it all starts to taste and look the same. Plus its a HUGE hassle to cook two to four ounces of chicken for lunch – I really have issues with leftover chicken, long story. Needless to say, I often opt for a handful of roasted soy nuts or a slice of low fat cheese and an apple for lunch – see, lazy. A few weeks ago, Clint and I were cruising through SAMS, checking out all the samples – you know, eating lunch – when we discovered a taste of pure ambrosia. 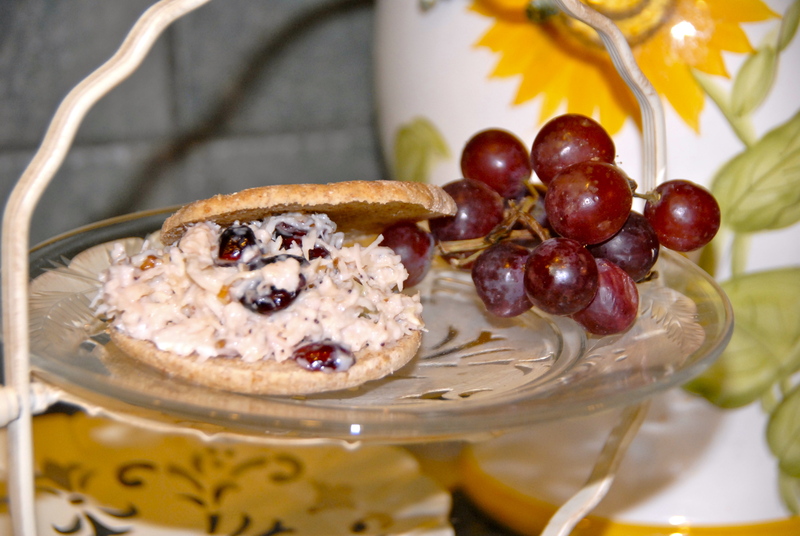 It was a cranberry chicken salad with pecans – my mouth is watering now just thinking about it. The chicken salad not only contained cranberries and pecans, but was mixed with a honey poppyseed dressing. Although it was pricy, over $11 for a meager container, we had to have it. It was so scrumptious, that we were getting back in line for another taste. SAMS’ marketing gurus know what they are doing with the free samples; they paired the chicken salad with 100% whole wheat mini pita flatbread. Of course, we bought some of those as well – one wasn’t any good without the other, right? We figured that this expensive purchase would get us through lunches for the next week or so. Wrong. Try a couple of days. The only sensible and economical solution was to figure out the combination of ingredients and make our own perfect chicken salad. We had the canned white meat chicken and pecans, so we were two thirds of the way to our goal. We found dried cranberries in the bulk organic food section at Crest. The dilemma was the honey poppyseed dressing; we found several different brands of poppyseed dressing, but none with honey. Okay, we are both educated people – no, seriously we are – the simple solution would be to add our own honey. While we were excitedly going over the contents of our new favorite dish, we recalled that the purchased version also had celery. With ingredients in hand and a very large bowl, I began the process: drain and fork the chicken, check; chop pecans and celery, check; add cranberries, check. The only scary part was the dressing. Adding too much honey could ruin the feast, whereas too little was easy enough to overcome. I opted to mix it in smaller batches and finally came up with a 7:1 ratio of dressing to honey. The results – perfection! This dish might not be an exact duplication of the more pricy container, but it was less than half the cost of the SAMS version. This week I can be as lazy as I want with my lunches, but it will be anything but boring. Drain and fork chicken to separate. Add pecans, celery and cranberries; mixing thoroughly. Add poppyseed dressing alternately with honey. Mix and serve on pita flatbread or other whole grain bread. Store in air-tight container. Enjoy!